Representing the widespread efforts of local planning authorities to make sense of conflicting voices are two towns, one near the end of its process, and one still close to the beginning. 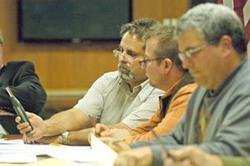 Supervisors in Palmyra Township in Michigan (right) decided to rescind an earlier tightening of their noise and siting regulations, after a wind developer said the rules as adopted would likely prohibit construction in the town. In a 3-2 vote, the majority were concerned about such a prohibition, agreeing with Supervisor Dale Terry, who said, “I’m not sure that is fair or proper,” while one joined with Steve Papenhagen, who stressed that “I don’t know how we can force this on landowners that don’t want to be a part of it.” The Supervisors re-established a noise limit of 45dB at buildings on neighboring properties, up from 40dB in the previously amended plan. In Frankfort, Maine, where a four-to-six turbine project is planned, a community meeting on a proposed wind farm ordinance got heated, culminating in a shouting match between a developer and an anti-wind activist outside the building after the meeting ended. (Apparently, they embodied the state of our current dialogue to perfection, each yelling that the other was a liar!) A committee that had developed a draft ordinance presented it at the meeting; they proposed a 1-mile setback, and noise limits of 45dB during the day and 32dB at night, measured at neighboring property lines. State regulations currently call for 55db during the day, and a recently proposed 42dB at night, measured at homes. Josh Dickson, who served on the committee, noted that noise heard at homes, especially at night, can cause insomnia and hypertension, according to their findings. “At the end of the day, this is research. It’s not perfect. Neither are we,” Dickson told the crowd. “We did the best we can. The decision will be up to you guys, not us.” The small wind developer planning the project, Eolian Renewable Energy, is proposing a setback of three times the height of the turbines, or about 1000 feet, and also calls for using the state noise limits. A woman from Freedom, Maine, spoke at the Frankfort meeting, and shared an unusually clear and poignant story of noise impact at their home, 3000 feet from one of several turbines. Her three kids have all been prescribed sleeping pills due to wakefulness since the turbines began operating; this strikes me as particularly noteworthy, since the kids are less likely to be affected by pre-existing concern or fear, which some blame for the reports of sleeplessness and stress in adult wind farm neighbors. 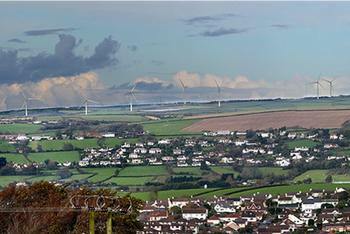 The wind developer in Devon, ESB, will begin noise monitoring once the wind farm is fully operational. “ESB will continue to work closely with the local community – particularly our immediate neighbours and North Devon Council – to ensure we not only meet all conditions of the planning permission, but that we are able to discuss local concerns and take what measures we can to address issues,” commented a company spokesman. North Devon Council’s Environmental Health Department will also conduct site analysis at five locations in response to residents’ concerns. While it’s quite common to hear from wind farm supporters who were surprised and dismayed by the noise levels they encountered once the turbines were operating, we hear the opposite tale from Leicestershire, UK. There, after living for seven months with a new wind farm, some opponents are saying it’s not as bad as they feared it would be. The article quotes two former objectors and one wind turbine host and doesn’t specify many distances, but one farmer “less than a mile” away says “I went to all the protest meetings and I was against them from the start. But now, I must say they don’t really bother me. I can’t hear them and I can barely see them. It’s like the industrial revolution all over again – people don’t like change until it actually happens and they get used to it.” This could be a simple case of people a fair distance away being more worried than they needed to be; a quick search online didn’t come up with news reports of problems from other (closer) residents, but it may be too early to assume there are none, especially since they’ve yet to go ’round all the seasons. Knight’s experience in Devon, as contrasted with Pikes, is a great illustration of the disconnect that continues to dog wind farm development and ordinance-writing. I think we can safely assume that Pike’s not imagining the sound that’s bothering her, and that Knight visited at a time and place where the turbines were inaudible (and it must have been daytime, since farm machinery was operating). Complicating the challenge before town boards is a widespread uncertainty about who to trust; as noted by Palmyra Supervisor Jim Isley, “I have to wonder sometimes if one side doesn’t exaggerate their claims, and the other side perhaps doesn’t tell all that they know.” Indeed, AEI’s continuing attempts to make sense of the polarized rhetoric coming from the two sides suggest that both tend to overstate their case. 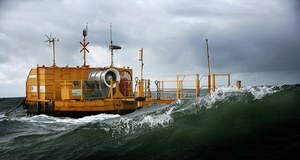 Developers often downplay potential noise issues; for example, the Eolian website lists typical rural sound levels at 40dB (probably a 12 or 24 hour average), while night time sound levels in deeply rural areas are often measured as low as 20dB, so that a turbine may become a truly dominant sound. Meanwhile, community groups tend to assume that the worst-case responses they hear about elsewhere will be common, even at great distances. For example, a letter published this week about a proposed wind turbine at a gravel plant in California, expressed concerned that a school is “only 1.5 miles away.” The letter claims that Oregon requires a two-mile setback (they don’t: though their noise limit is one of the lowest, 36dB, setbacks tend to be in the half-mile to mile range). Even many more cautionary acoustics experts, who tend to favor noise limits of 30-35dB, suggest that 2km (1.25 miles) is a reasonable minimum setback, with some recommending a mile and a half; the gravel plant turbine doesn’t appear to be close enough to warrant alarm or heightened concern. We clearly have a long way to go before we can have a clear, reasoned discussion about whether current setback standards are providing a degree of community noise protection that’s similar to that we’ve become used to from other noise sources.